BATON ROUGE, LA (WAFB) - A Baton Rouge man was out fishing along the Mississippi River Saturday when he came across his biggest catch yet. 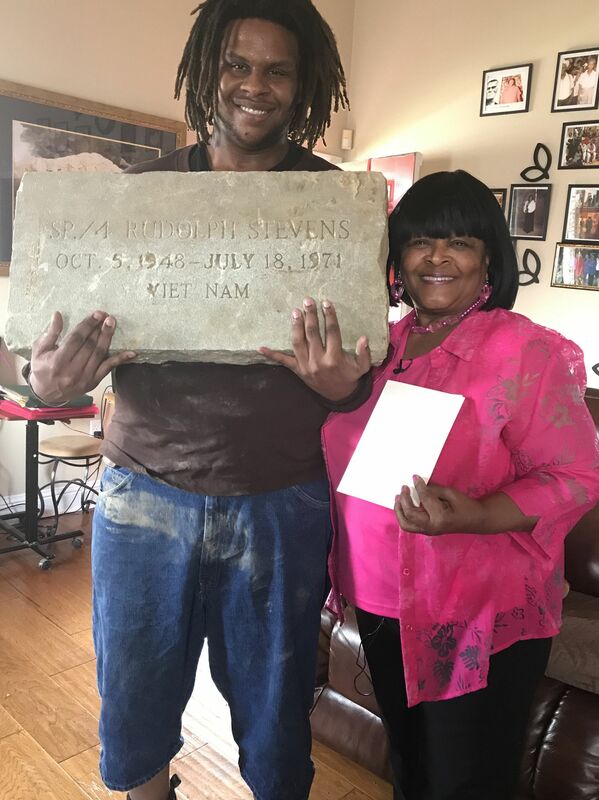 While passing under the Horace Wilkinson Bridge, 26-year-old Deion Allen discovered a headstone. “It looked like a piece of rubble, but then I read it and saw it was something more,” said Allen. A friend fishing with Allen informed him that the headstone belonged to a Vietnam veteran. "It really meant something to me... I had to get it back to the rightful person,” Allen said. Allen says he is a proud veteran of the United States Marine Corps. He described his experience as a vet as an irreplaceable part of his identity, and a reason he felt even more shocked by the discovery. Allen says his first thought was that the headstone may have been displaced during the historic 2016 floods. He launched a search for the family armed only with the name “Rudolph Stevens” and the dates he could make out on the headstone. WAFB learned Wednesday Rudolph Stevens was a specialist in the Army who was drafted in 1970 to serve in the Vietnam War. At 22-years-old, Stevens died when he drowned in the South China Sea. “He died in the service,” said Stevens’ sister Sabra Henderson. Henderson saw the headstone on WAFB Monday after Allen asked for assistance locating any surviving family members. While Henderson told her brother’s story to WAFB cameras Wednesday, not expecting any other visitors, she received the surprise of a lifetime. Specialist Stevens is buried at Gilbert Cemetery in Baton Rouge. Another headstone has been on his grave for years with the wrong birth date on it. For now, the correct headstone is in Henderson’s backyard. “It feels like we have connected again,” said Henderson. “Just seeing her face, a lady like this, she reminds me of my mom and it’s the little things that make people smile,” said Allen. The moment was the start to a lifelong friendship for two strangers. “Deion, we thank you so much. The best is yet to come for you,” said Henderson. Everyone is still trying to figure out how the headstone washed up along the river but the family hopes to change out the wrong one with the correct one.